If you happen to be injured due to a criminal action in Miami Shores, you should know that Florida laws may entitle you to compensation. To determine if you are eligible, call our Miami Shores crime victim lawyers at the Wolfson Law Firm for a free consultation. You can reach us at 305-285-1115. Miami Shores is a small village in Miami-Dade County, Florida. It was once called the Biscayne neighborhood, but after the depression in 1932, it was incorporated as a Miami Shores Village. Just a little bit more of 10,000 people live there. 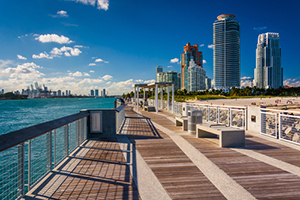 It is surrounded by Miami, North Miami and North Miami Beach. The village is also the home of the Barry University campus. You can contact us even if you or your loved ones have been injured in another type of crime. The type of crime you are injured in doesn’t dictate your entitlement for damages recovery, so don’t hesitate to call our Miami personal injury attorneys for help. There are three ways to recover financially as a crime victim in Miami Shores, Florida. You can claim damages from the criminal offender, third parties or from the Florida Bureau of Victim Compensation. Recovering from the offender requires that he is proven guilty and convicted. Once the trial has reached that point, it should be easy to get compensated by him, but that’s rarely the case. Offenders sometimes don’t get caught by the police; most usually don’t have funds to pay you for damages. Even if they are caught and they have enough funds to pay you, this criminal trial can last for too long before you even file for damages against him. If you can’t afford to wait while taking this risk, you can consider to the other options. Those injured on premises of commercial locations can claim damages from the persons or companies who control those premises. Under Florida premises liability laws, they owe you a duty of care, meaning they must take all the reasonable measures to thwart foreseeable crime on their premises. When they fail in doing so due to negligent security, it could lead to criminal incidents and actions. If you’ve been injured in such a criminal situation, you may be entitled to claim damages from that third party or person. Another option is applying for compensation from the Florida Bureau of Victim Compensation. They won’t ask if anyone has been proven guilty and convicted or not. If you can support your claims that you’ve been injured due to a criminal attack in Florida, you meet the legally set requirements for recovery for some of your economic losses. It might sound simple, but our 50 plus years of personal injury recovery experience has proven that there are many obstacles on the road to crime victim compensation. Call our Miami Shores crime victim lawyers at the Wolfson Law Firm for help at 305-285-1115. Consultations are free, and we don’t request for fees unless we recover for you.